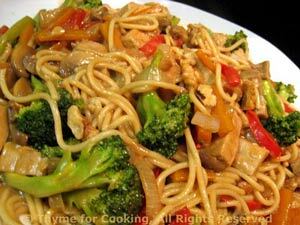 Pork Lo Mein with Peanut Sauce, Healthy Weekly Menu Plan. Lo Mein is simply a stir-fry with noodles - spaghetti, in this case. I would normally put peanuts with this but, I have walnuts (3 trees) and rather liked the effect. Besides, they're good for us! Everything cooks in less time than the spaghetti. Stir-fries cook quickly and are very flexible when it comes to ingredients. I always try for a mix of colors, textures and flavors... And whatever is left in the fridge. Amounts are not precise, just try to keep it balanced. Julienne the pepper and carrot. Cut broccoli into florets (with some stem). Cut the pork into large bite-size pieces. Heat olive oil in large nonstick skillet over medium-high heat. Add onion to skillet and stir-fry for 2 minutes. Add garlic, ginger and stir-fry another 2 minutes. Remove onions/garlic from pan and set aside. Add sesame oil to pan and heat. Add pork and stir-fry 3 - 5 minutes, until nicely browned. Remove and put with onions. Add broccoli, carrots, mushrooms, pepper to skillet and stir-fry 5 minutes. Return pork, onions, garlic and ginger to pan. Add beef stock and bring to a boil. Cover, reduce heat and simmer for 5 minutes. In a small bowl, whisk together sherry, soy sauce and peanut butter. Uncover skillet and stir in peanut butter mixture and walnuts. Stir in cornstarch mixture until thickened. When pasta is done, drain and add to skillet. Toss to combine, tongs work best, or two forks. Serve. Add more soy sauce if desired, according to taste.